Better Projects: PowerPoint... Friend or Foe? A few weeks ago, an article from the New York Times website regarding the use of PowerPoint in military briefings began to circulate around the internet. I didn't comment on it when it first came out, but would like to share some thoughts about BAs and PowerPoint that go hand in hand with the article. If your primary vehicle for a status update is PowerPoint, you've got a larger issue in the mentality of your organization. PowerPoint is a tool and like all tools, they should work for you. PowerPoint is for presentations and there are some things that are so complex that they simply cannot be summed up with bullet points. I won't go so far as to agree with one of the quotes in the article that the application makes people 'dumb', but I will say that it can definitely make you lazy. Using any presentation software can present the false promise of making difficult information accessible to anyone, but the truth is, your information is only as accessible as you want it to be. It doesn't matter if you're using a Microsoft product, Lotus Notes for email or an Adobe product for a graphic, if you don't take the time to show the relevant information in context then you are deliberately wasting the time of everyone who will see your end product. The graphic that is shown in the article (and included in this post for reference), is amusing as an illustration of this principle. Can you look at that graphic and honestly say that the person who created it wanted to convey information beyond 1) they really know how to make a snappy looking graphic and 2) they desperately wanted to look really smart. A better approach would have been to remove all the detail from the graphic and reuse that information on subsequent slides. You keep the initial graphic at the high level, then drill down into deeper levels of detail as you unfold your presentation. At the end, pull it back up to a high level and summarize the key points. But I understand the mentality to not follow those steps, mostly because I pioneered what I eventually began to refer to as "The Slide That Just Won't Die." My boss asked the team if we could put together a slide that shows all the interfaces in and out of the system we were implementing. I spent hours putting my version together and in the end it was selected as the one that would be used for an executive presentation. It had around 20 interface paths and a dozen or so systems. It frankly looked like a birds nest made of multicolor yarn. 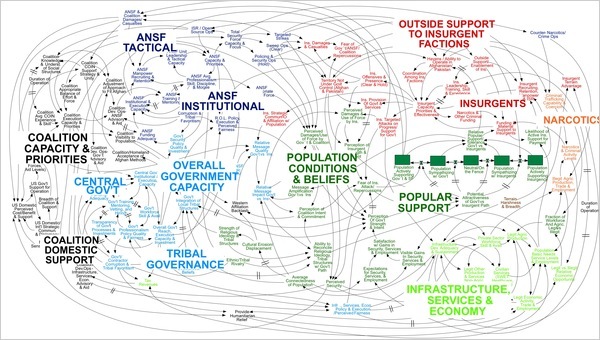 I remember being insanely proud of this chart that did such a great job of showing the complexity of our solution. I gave them complexity alright, but what I should have been striving for is clarity. My slide didn't get its nickname for several months, namely because of how far through the organization it spread. About 6 months later it made an appearance when a VP was asking my opinion on how she might include it in a presentation she was putting together. That doesn't seem such a big deal until you understand the VP in question had no idea I was the author of the slide. It had gone so far around the organization that its source, me and my team, were no longer even connected to it. Yes, I did laugh about it, but only after I got away from the VP. I have no idea how many times that slide was shown to how many people, but I do know that most of them walked away utterly confused by my monstrous creation. Just call me Dr. Frankenstein. I wouldn't be surprised if it was still floating around in that organization given the couple of years worth of viewings it got while I was employed there. So I implore you all, don't create a monster. Keep your PowerPoint slides simple. Keep them focused. Make yourself and the necessary information the focus, not your ability to put together a slick yet useless slide. Care is needed here, for several reasons. The NYT is fond of taking things out of context for political reasons. 2nd the "slide" is actually a Mind Map of all the interactions between the participants in the theater. See http://herdingcats.typepad.com/my_weblog/2010/05/the-misinformed-crticism-of-power-point-critics.html for the original mal-informed response. In the end the "slide" was meant to convey that the problem is intractable and this IS the top level interface diagram. CONTEXT and DOMAIN are missing from many NYT articles when it comes to the Defense Department. Thanks for your comments, Glen. I actually read your article right after you posted it, but in the intervening time, your points about the NYT source had slipped my mind. I do stand by my points though that we should seek to show clarity and not complexity in presentations. My point was that using any presentation as a primary vehicle for comprehending any complex subject, be it DoD, eCommerce, ERP, CRM, what-have-you, is probably not the best way to accomplish your goal. The example from the NYT looks to have been possibly poor, but the principle itself still stands. Yes, clarity is hard; it is much more difficult than simply showing complexity. In the context of the NYT PPT, showing clarity is simply not possible. I'd assert that the PPT used is about as clear as it gets. I say this with some credibility, since we work programs that support Southwest Asia as it is called for the Air Force and the Army. The PPT had the desired effect on the audience - "this problem is intractable as currently envisioned." "Any attempts to seek simpler solutions will fail." "This is a text book case of a wicked problem." Now these words don't come from the NYT, but from defense journals. The notion that seeking simplified for simplicities sake is a common mistake in the complex problem domain. would be foolish and lead people to believe this system is less complex than it is. The challenge here - like everywhere - is what is the unit of measure of clarity, simplicity. Is a Clear and Simple description of the concurrent interaction of 18 major weapons systems with 157 subsystem the same Clear and Simple for eCommerce system ordering bird food supplies at PetSmart? Probably not. Without context, domain and the units of measure - all statements have little meaning.